Corbett National Park was the first protected area to be declared as a Tiger Reserve. Named after the legendary hunter of man eating tigers Jim Corbett the region abounds with rich wilderness. The park is now a hub of tiger tourism and birding in India. The entry has to be booked in advance using the online facility or through a tour operator. All zones are equally good for a safari but I personally rate Dhikala and Bijarani as best. In Dhikala one can see plenty of birds apart from the tiger, wild elephant, sloth bear, gharial and marsh crocodile. For a game round Dhikala a stay in the complex is necessary. The booking is done in advance due to the heavy rush. Bijarani is good for tigers and other mammals found in the reserve. There are more than five hundred avian species to be sighted here. Many of these are altitude migrants while some arrive from far but local migrants and residents abound. The region is having affinity with Indo-China hence one can see the goral as well on the mountain slopes. Hod deer is another species worth looking for. There are more than six hundred wild elephants which cover an extensive area. The reserve is top rated by bird watchers in Northern India. The best season is of course in winters. For tigers summers is the best season but they are visible throughout the year. The destination has more than 200 tigers hence the impressive sightings. Joy rides on elephant back are also available which are conducted by the forest department in the zones. In the buffer region at Ramnagar one can hire privately managed elephants for ride in the forests adjacent to the Ramganga River. For safari in other zones stay at Ramnagar is the best as there are many hotels and guest houses. One can avail any kind of accommodation depending upon one's budget. Corbett is accessible from Delhi by road and a visit is often organized in a package tour. The itinerary often contains a visit to Bharatpur, Nainital and Corbett. While the first two are for bird watching the latter is for tiger tours apart from bird watching. The destination is also accessible by train from Lucknow and New Delhi. Due to extreme cold one needs warm clothing and a cozy place to stay. If you are not in a package tour then hire a birding guide to hence the checklist. Thank you for turning up and reading my article. My love for wildlife was merely an accident. I along with a few friends just landed up at Ranthambore National Park, Sawai Madhopur Distt. Rajasthan India. This was a very unusual trip for me since i have always loved luxury and relaxing holidays, but little did i knew that once i enter the forest lovingly called as Ranthambore Tiger Reserve, I instantly felt a strong connect with this place. I hardly had any interest in wildlife and was doing absolutely nothing except for looking at a few deer's roam around and a few birds here and there and then to my surprise i was asked to sit back tight as the gypsy caught up with unusual adrenaline and it seemed like i was on the last ride of my life. For good two minutes i was rather angry for being there all covered by dust and splashes but than it all came to a halt and in a split second it changed my outlook for wildlife forever, A gigantic roar from across the bushes was enough to send chills down my spine,lips sealed i looked to the other side of waters(Rajbagh Lake) and it was a sight to behold and treasure. A female tigress(T-19) aka Krishna showed up frowning towards the maddened rush of gypsy and canters, As a few hundred eyes lit up seeing the beast walk around the bushes. It was an amazing thing to experience but what happened next was a mere dream. The light started to fade away and as the tigress walked, from the bushes i heard another unusual sound and yes there it was a dream for many wildlife lovers, She was followed by 3 beautiful cubs. What more could you ask for, I stood admiring the beautiful relationship of the mother and her 3 adorable cubs who walked beside her in a straight line unaware of surroundings and soon disappeared in the habitat i now know as Malik Talab at Zone no. 3 of RNP. Amidst the hustle bustle of my daily life coming into a jungle where i could literally hear myself breath,inhaling that fresh crisp air that brought peace to my mind, a feeling of a different world, a glimpse of a relation of a mother and baby which wasn't too different from real life human relations and that was the point RNP became a addiction and a wonderful 2nd home to me, I visit almost every month familiar to every Zone(1-10) and very familiar to almost all named tigers, May it be courageous story of T-16(Machli) or the Ravishing T-24(Ustaad) or the hunkT-72(Sultan) and many family like names to me now. Do love Nature, Protect Wildlife, Respect Animals and pledge to help make earth a better place for all to live in..! My love for wildlife was merely an accident. I along with a few friends just landed up at Ranthambore National Park, Sawai Madhopur Distt. Rajasthan India. This was a very unusual trip for me since i have always loved luxury and relaxing holidays, but little did i knew that once i enter the forest we lovingly call as Ranthambore Tiger Reserve, I went all Gaga over this place. I hardly knew what i was doing there except for looking at a few deer roam around and a few birds here and there and then to my surprise i was asked to sit back tight as the gypsy caught with unusual adrenaline and flew it seemed like i was on the last ride of my life. For good two minutes i was rather angry for being there all covered by dust and splashes but than it all came to a halt and in a split second it changed my outlook for wildlife forever, A gigantic roar from across the bushes was enough to send chill down to the spine and lips sealed i looked to the other side of waters(Rajbagh Lake) and it was a sight to behold and treasure a female tigress(T-19) aka Krishna showed up frowning towards the maddened rush of gypsy and canters, As a few hundred eyes were lit up seeing the beast walk around the bushes and what happened next was a mere dream. The light started to fade away and as the tigress walked away followed by 3 beautiful cubs and what more could you ask for. The light almost giving up as i stood admiring the beautiful relationship of the mother and her 3 adorable cubs who walked beside her in a straight line unaware of surroundings and soon disappeared in the habitat i now know as Malik Talab at Zone no. 3 of RNP. I have visited many wildlife sanctuaries accord south india .And iam deeply interested in wildlife photography which always emphasizes me with much eager and makes me learn in each and every picture.Since it is my first blog , i continue further in my coming blogs . The leopard in the above picture is the very embodiment of helplessness and misery. A young subadult, no more than 3 years old, it probably made its way from Rajasthan’s Kumbhalgarh National Park to Rajsamand district’s Sardul Kheda village, where its head got stuck in a pot, probably while it was looking for water. This story has a happy ending ; the villagers who found the shell-shocked leopard roaming around with its head trapped in the pot informed the Forest Department, whose personnel tranquilized the leopard and set it free in Kumbhalgarh’s forests. 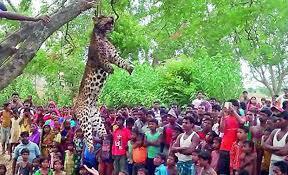 But numerous incidents of leopard “straying” dont end in the same way; in June this year, a leopard that had entered Tatuarah village in West Bengal’s Purulia district was brutally killed and strung up on a tree. Its paws and tail were hacked off. In August, another leopard was beaten to death in Assam’s Sivasagar, which has been a hub of man-leopard conflict for a long time. The Purulia leopard, which met a grisly end. though there is a lot of debate surrounding the veracity of this figure, as it is based on the arbitrary extrapolation of an estimated population of 7,910 leopards dwelling in tiger habitat. One of Bandipur’s leopards, captured on a camera-trap unit. The most adaptable big cat, leopards are capable of residing in almost every conceivable type of habitat, ranging from the tropical evergreen forests of the Western Ghats and Arunachal Pradesh, to dry scrubland surrounding villages in Rajasthan and Gujarat, and the tea gardens of Assam and North Bengal. Leopard-human conflict is extremely common, as more and more of them are forced to dwell cheek-by-jowl with humans who destroy their forests and hunt their prey. 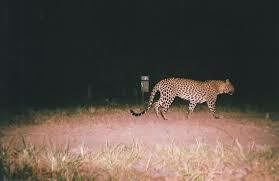 Panicked residents of cities and villages who spot the big cat in their midst frequently attack it, without realising that the vast majority of leopards don’t see humans as prey. Untrained, under-equipped and overstretched forest department personnel are often forced to confront bloodthirsty mobs without police support. The ever-increasing nature of human population means that such incidents are becoming more commonplace. i think that is indian crane i click phoytos of them and i participate in wild life photography i place 3rd rank . We are also fascinated by the fungus and just started a page because we believe it is important to do it in a sustainable way. Otherwise cordyceps sinensis will be disappearing soon from the slopes of the Kashmir Himalayan. Asha----The Last Hope for Central India's Wild Buffaloes? The boma in Chattisgarh’s Udanti Wildlife Sanctuary has a unique resident- Asha, one of Central India’s last wild buffaloes. At first glance, she looks strikingly similar to her domestic kin, but a closer inspection reveals the massive spread of her horns and huge bulk, which are unmistakeable characteristics of the wild buffalo. Asha’s proud ancestors would once have roamed across much of Central India and Northeastern India. The eminent hunter-naturalist Dunbar-Brander, writing in the 1920’s, wrote of their abundance in the forests east of Balaghat, with their biggest stronghold being Bastar. Unfortunately, the wild buffalo’s range and population have undergone a massive contraction since. A survey in 2007 by the NGO Wildlife Trust of India (WTI), estimated their total population in Central India as being less than 50 individuals. Indravati, home to the largest population ( of about 25-30 individuals) , was in the grip in left-wing extremism, and hence, no conservation programme could be taken up there. 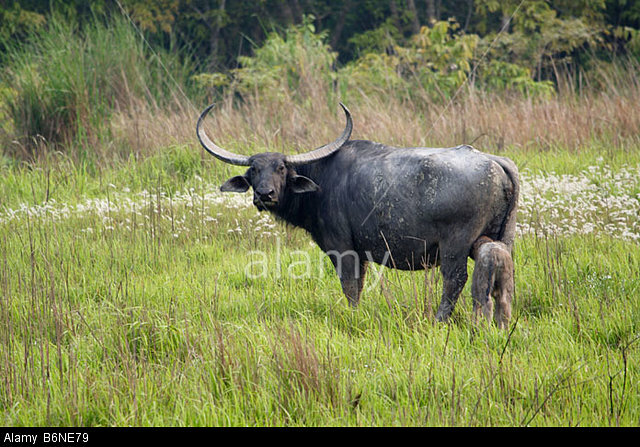 Udanti in Raipur district was found to have 7 wild buffaloes, of which only 1 was female. The decline has been particularly steep in recent times, since in 1993, Chattisgarh itself was believed to be home to around 250 buffaloes, with both Indravati and Udanti having approximately 100 individuals each. Healthy populations of these giant bovines continue to exist in quite a few Protected Areas in the Northeast, such as Kaziranga, Manas and Dibru Saikhowa in Assam, Balpakram in Meghalaya and Dayang Ering in Arunachal Pradesh. A wild buffalo with its calf in Kaziranga National Park. However, many of the Northeast’s 3000-3500 wild buffaloes are believed to have been adversely affected by interbreeding with their domestic kin, and the remaining populations are also threatened by the destruction of their wet grassland habitat and poaching. Asha, with one of her calves, at Udanti. WTI, with the assistance of the Chattisgarh Government, swung into action immediately. A “Wild Buffalo Conservation Project” was framed. Conservation initiatives could be undertaken only in Udanti, as it was the only habitat of wild buffaloes which was free of naxal violence at that time (sadly, naxals have extended their control over much of udanti, and neighbouring sitanadi, since 2009-10. However, attempts to conserve the wild buffalo continue). Given the very low population in Udanti, conservationists were determined to prevent any unnatural deaths, which could lead to the extinction of the population there. A “boma”- an artificial enclosure was constructed for the last female buffalo of Udanti, aptly named “Asha”, or hope. She has given birth four times since. Conservationists, however, could truly rejoice only when she gave birth to a female calf, named “Kiran” for the first time earlier this year. Her previous three calves had all been male. The male calves grew up in the boma with her, before joining the herd, which spends most of its time in an adjoining grassland, with some boisterous males frequently visiting the adjoining villages to mate with the female domestic buffaloes there. 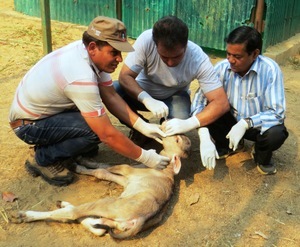 One of Asha’s calves gets a health check-up. Not wanting to take any chances, Karnal-based NDRI (National Dairy Research Institute) cloned Asha in January 2015, producing a female calf named “Deepasha”. These three females represent the last hope for Chattisgarh’s beleaguered wild buffaloes. Asha herself is 13 years old, and a female wild buffalo is normally reproductively viable for about 15-17 years of her lifespan, which is usually 20-22 years. Even though administrative apathy and a steady rise in naxal presence in the surrounding forests have stymied initiatives, several attempts have nonetheless been made to preserve the buffaloes of Udanti. These involve the inoculation of livestock residing in fringe villages, the deweeding of grasslands, and the providing of incentives to villagers encouraging them to sell off domestic buffaloes, so that interbreeding between domestic and wild buffaloes, leading to a contamination in the genetic stock of the latter doesn’t occur. Attempts are also being made to procure genetically pure wild buffalos from the Northeast to boost Udanti’s tiny population. In spite of so many measures, however, the path ahead is still treacherous. In 2009, a tiger reserve, covering 1,842 sq. km (with a core area of 851 sq. km) was eked out of Udanti and adjoining Sitanadi wildlife sanctuary. The Udanti-Sitanadi tiger reserve suffers from several management lacunae, however. These include a highly complex administrative set-up which is not conducive to tiger conservation, with the Field Director’s office being located in distant Raipur. Moreover, protection infrastructure such as anti-poaching camps and vehicles for patrolling, is severely lacking. The DFO’s managing these sanctuaries are often burdened with non-wildlife conservation related tasks, dealing with the management of the surrounding territorial forests. A massive overhaul of the protection mechanisms currently in place need to be carried out by the State Government. This will be very hard to carry out, however, given the ongoing naxal insurgency in the landscape. Udanti-Sitanadi should not be written off, however. Along with the contiguous Sunabeda-Khariar forests in western Odisha, it forms part of a compact forest block extending over 3000 sq. km, which serves as an important habitat for many species of Central Indian flora and fauna. Proposals to denotify such “lesser” forests are based on a poor understanding of their ecological potential, and should not be acted upon. Tigers with cubs have been reported from Udanti and surrounding forests in recent times, and, for the first time, a tiger was camera trapped in 2014, an event which put to rest niggling doubts regarding the presence of tigers in the landscape. 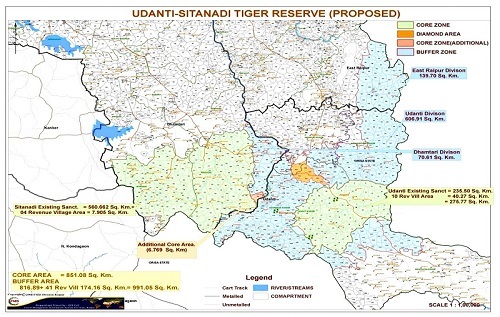 A map of the Udanti-Sitanadi Tiger Reserve. Attempts have also been made to conserve the other viable population of wild buffaloes in Central India, in the Indravati landscape. Indravati itself may be out of bounds to the Forest Department, but neighbouring Kolamarka, in Maharashtra’s Gadchiroli district, frequently plays host to a couple of herds. A 181 sq. 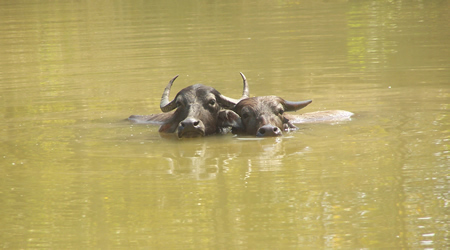 km area in Kolamarka was declared a conservation reserve in 2013, for the conservation of wild buffaloes. Inspite of recurring incidents of naxal violence, a dedicated team, led by RFO Atul Deokar, have been diligently monitoring the wildlife of the region, while undertaking numerous conservation initiatives with the help of the local villagers. Kolamarka is also an important habitat for Maharashtra’s state animal, the Indian giant squirrel ( Ratufa Indica). To sustain these initiatives, support from the State Government is key. Kolamarka’s forests are threatened by habitat destruction and poaching, and conserving the small wild buffalo population here (estimated at around 10-15 individuals), will be a stiff challenge. 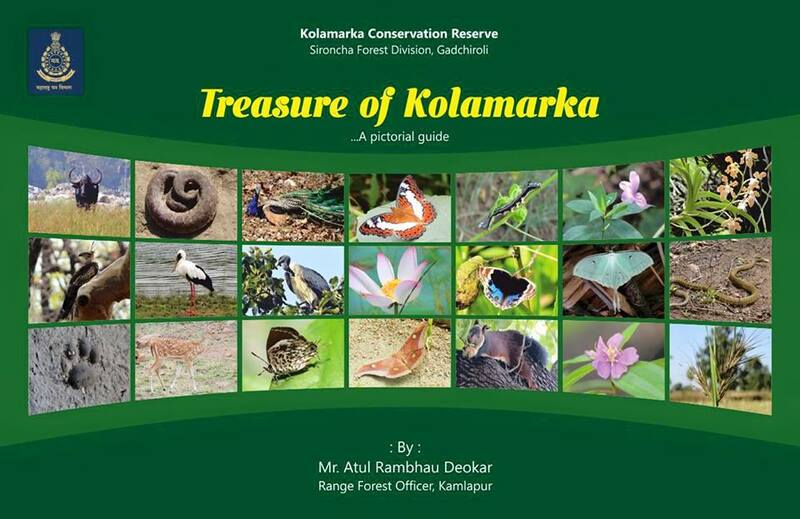 “Treasures of Kolamarka”-a book detailing the biodiversity of Kolamarka conservation reserve in Maharashtra’s Gadchiroli and is a product of the untiring efforts of RFO Atul Deokar and his team. Of late, the Central Government has also taken an interest in wild buffalo conservation, with the buffalo being one of the five target species for which recovery programmes have been implemented. Moving these plans from the cramped confines of the bureaucrat’s office to the field in the badlands of Udanti-Sitanadi is of the utmost essence. The Central Indian wild buffalo has never received the same amount of conservation support as the tiger or the elephant, with the result that it is poised on the brink of extinction in a region that was once its historical stronghold. Asha, the last adult female of Udanti, embodies the hope that the noble bovine will recover from the brink of extinction, and reclaim those forests which they once lorded over.